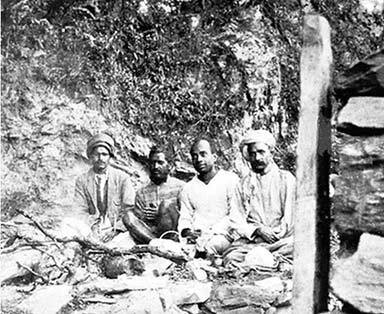 Lahiri Mahasaya’s grandson (second from right). It was years before I came to realize the divine stature of my husband. One night, in this very room, I had a vivid dream. Glorious angels floated in unimaginable grace above me. So realistic was the sight that I awoke at once; the room was strangely enveloped in dazzling light. My husband, in lotus posture, was levitated in the center of the room, surrounded by angels who were worshiping him with the supplicating dignity of palm-folded hands. Astonished beyond measure, I was convinced that I was still dreaming. “Woman,” Lahiri Mahasaya said, “you are not dreaming. Forsake your sleep forever and forever.” As he slowly descended to the floor, I prostrated myself at his feet. When I had finished my humble genuflections, the angelic voices sounded together, like a chorus from an ancient scripture. “Consort of the Divine One, thou art blessed. We salute thee.” They bowed at my feet and lo! their refulgent forms vanished. The room darkened. My guru asked me to receive initiation into Kriya Yoga. He touched my forehead. Masses of whirling light appeared; the radiance gradually formed itself into the opal-blue spiritual eye, ringed in gold and centered with a white pentagonal star. “Penetrate your consciousness through the star into the kingdom of the Infinite.” My guru’s voice had a new note, soft like distant music. Vision after vision broke as oceanic surf on the shores of my soul. The panoramic spheres finally melted in a sea of bliss. I lost myself in ever-surging blessedness. When I returned hours later to awareness of this world, the master gave me the technique of Kriya Yoga. From that night on, Lahiri Mahasaya never slept in my room again. Nor, thereafter, did he ever sleep. He remained in the front room downstairs, in the company of his disciples both by day and by night. I will confess a sin which I committed against my guru-husband. Some months after my initiation, I began to feel forlorn and neglected. One morning Lahiri Mahasaya entered this little room to fetch an article; I quickly followed him. Overcome by violent delusion, I addressed him scathingly. “I am here.” This reply came from above me. I looked up and saw the master materialize in the air, his head touching the ceiling. His eyes were like blinding flames. Beside myself with fear, I lay sobbing at his feet after he had quietly descended to the floor. My guru’s words naturally came true; a disciple did leave a considerable sum for our family.